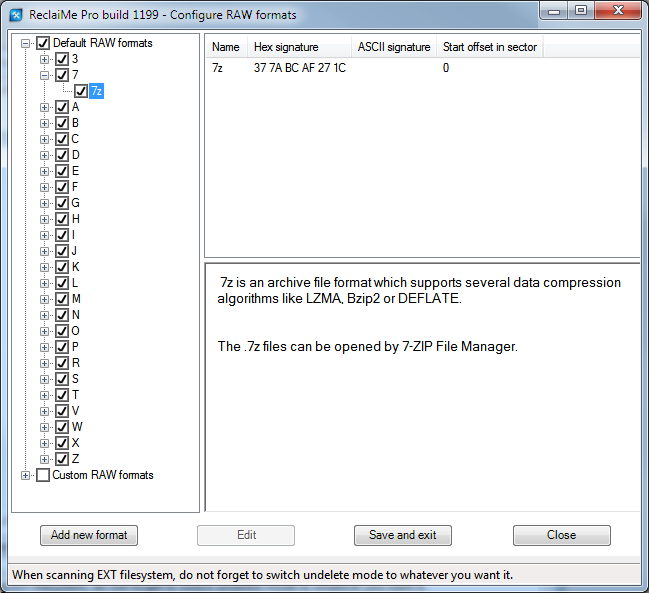 RAW scanner in ReclaiMe Pro searches a data storage for file headers. There is a set of default formats generated from the most common file types. All these formats are set by default for searching. Note that you cannot edit the default formats. two sets of offset and hex signature. You need to set at least a 3-symbol signature. Once you create a format, it goes under Custom RAW formats. You can then edit a custom format by clicking the Edit button. One-time configuration – ReclaiMe Pro searches for the format only during the current run and then discards it. Save configuration to the file – ReclaiMe Pro saves the format to the file and then loads it automatically during each launch. Send the configuration to the developers – the configuration parameters are saved to a file, which you then can send to us. If we find the format interesting, we will add it to the default list of formats so that it can be available to all ReclaiMe Pro users.